Construction Machinery - CSB Sliding Bearings India Pvt. 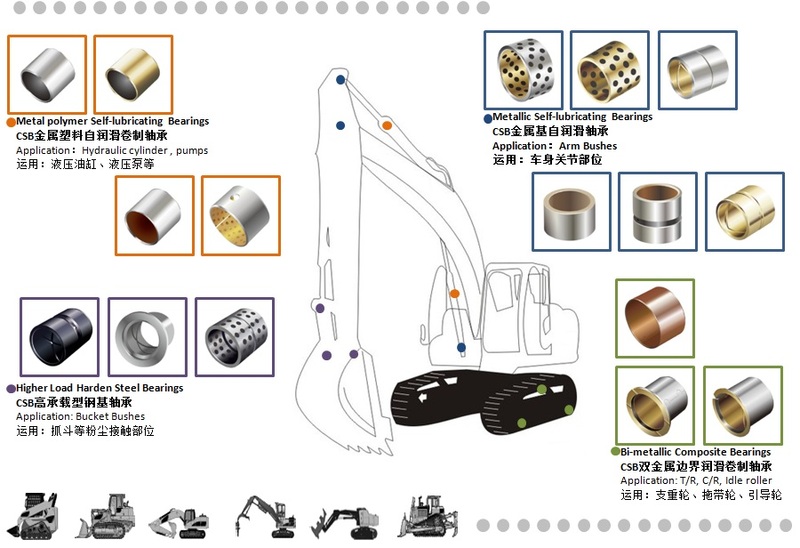 Ltd.
With the cooperated study and research, together with the customers, CSB has been successfully developed the most suitable bearings for the wheels, rollers, lifting arms, hydraulic cylinder bushings for the construction machineries including boudary lubricating bi-metallic bushings, metallic bushings and metal-polymer composite bushings. These bushings are made with the optimized wear resistance and dust protection features. The self-lubricating characteristics of the bearings provided considerable savings by expanded maintanance period and therefore make the machines working with higher efficiency.